I never saw my girls jump up and get so excited over music before I put in Warner Brother's Alvin and the Chipmunks The Squeakquel. There are many songs they loved but their favorite is Single Ladies. Those girls can dance and if my little one wasn't so keen on running around only in diapers, I would have recorded it as it was quite the show. If your children listen to music, they will know most of the songs if not all and will really enjoy it. We listened to it last night, right after we received it, and I woke up to it this morning as the almost seven year old was rearing to go! If your kids love The Chipmunks, they will love the CD and will really provide hours of entertainment and get your camcorders ready as they will want to dance, dance, dance! I think Warner Brothers should partner up with Wii and make a dance/exercise game out of it since it encourages them to get up and move! 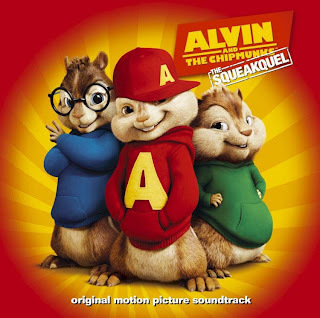 I definitely recommend Alvin and the Chipmunks The Squeakquel Soundtrack! *Disclaimer: I was provided a complimentary copy of this CD in exchange for my review. Upon completing my assignment, I will receive a cash payment. The opinions reflected in this post are of mine and were not influenced by the compensation that I might receive. What a great introduction to the Soundtrack. We find that our team loves to spread the word. If you feel like you could be an asset to the team, join!